Scorpio, First Half: October 23-November 6: The soul stone for early Scorpios is ruby, a gem celebrated in many legends dating from prehistoric times to the present day. Rubies were believed to be dragons’ eggs—very fitting for Scoprios, who have a lizard aspect to their souls. Rubies were believed to give the wearers invincibility. They were also thought to warn of danger by darkening in shade to a red that was nearly black. Rubies correspond to Mars, the first ruling planet of Scorpio, also associated with red. The most valuable rubies outrank even diamonds, and in the Bible, ruby is called the most precious of the gems first created in the world. If worn by a Scorpio, a ruby can re-channel passions such as lust, jealousy, and anger into more positive emotions. By all means, wear rubies, soulful Scorpios! We all get worn down now and again and, when that happens, we often feel blue or, at least in the doldrums a bit. If you have not other crystal, make sure to have rose uartz qon hand as it infuses you with self-love and brightens “the vibe” anywhere it is. I view self-love is a superpower and the real foundation of all true personal power. Widely known as the stone of unconditional love, the soft pink hunk of love known as rose quartz is said to attract and inspire love in all forms. It’s especially good for promoting self-love and emotional harmony. It can be a teeny tiny pebble of pink or a big ol rock but you should have it near you, especially when you are feeling low. I say have some around at all time but, then again, I have crystals in every room. Keeping a piece of Rose Quartz out where we can see it, on your desk at work, on your bedside table or next to the bathtub, can act as a powerful visual reminder to take a little bit of time for yourself. I'm going to describe a few possibilities, and then you take that knowledge and use your imagination. The sky is the limit ! To prevent reinventing the wheel, in this blog post I am going to simply describe how to create your representative grid, and you apply the knowledge from the post on programming to flesh out the "how to". 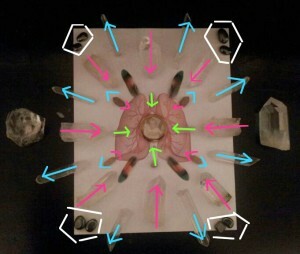 Making a crystal grid. Recently I had a request for a more detailed description of how to do this. This blog post is in answer to that question. 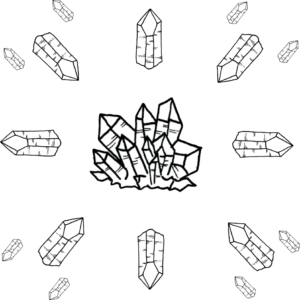 FIRST, WHAT IS A CRYSTAL GRID? 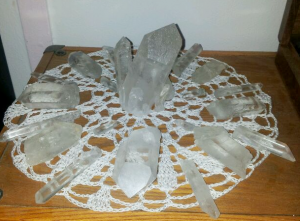 A crystal grid is a layout of crystals programmed for a specific intent or to produce a particular response. Virgo, First Half: August 22-September 5: Black opal is the soul stone for early Virgos. Virgos are perhaps the most discriminating of signs and would relish the fact that until recently, black opals came from only a few acres in Australia. The ancient Romans, seeing the rainbow colors of opals, believed them to be the bridge between heaven and Earth, but they especially desired the few poor-quality black opals (now believed to have been faked) held by the barbarians in Hungary. The finest grade of black opal was discovered on the island of Java, in Indonesia. For Virgos, only the best and only the real black opals will do. Members of the sign of service and help to others, Virgos gain strength and intensity and augment their own purity with black opals. This stone has been called the gem of hope, and, as such, offers a high level of consciousness for Virgos. The power talisman for first-half Virgos is labradorite, the lovely iridescent stone that originated in Labrador. Like Gemini, Virgos are ruled by Mercury, and the quicksilver, peacock-hued labradorite is good for providing the mental swiftness Virgos need to accomplish all of their goals in life. This type of feldspar can reflect every color of the spectrum and help Virgos from becoming too task oriented—too focused on one thing. No one can work harder than Virgos, and labradorite can prevent exhaustion from overwork and can also ensure that early Virgos activate a variety of talents.